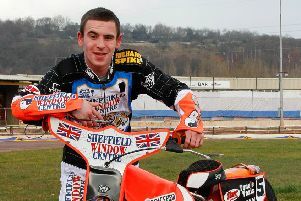 Solid Sheffield gave their Championship Shield qualification hopes a huge boost with a 51-39 away win at Redcar last night. Tigers completed an important double over the Teesside outfit in the space of 24 hours, leaving them safe in the knowledge that a draw at Newcastle tomorrow would be enough to see them progress. Sheffield moved into the lead for the first time courtesy of a 5-1 from Lasse Bjerre, at his former home circuit, and influential reserve James Shanes who cut back underneath Jonas B Andersen off bend four of the opening lap. They extended that lead to eight points in the fifth when captain Kyle Howarth pulled off a replica move of Shanes on Andersen, but this time off bend two while team-mate Todd Kurtz had gated and gone out front. The hosts brought in ex-Tiger Ty Proctor as a tactical substitution in heat six, but in-form Sheffield man Charles Wright made a lovely gate for a share of the spoils. 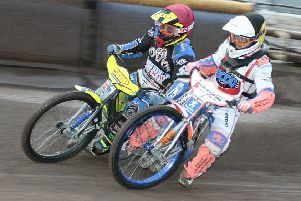 Kurtz swooped aeons his opponents in the eighth to lead a 4-2 and his second successive race win as the Tigers went ten up. But Redcar weren’t prepared to back down just yet and reduced the gap to just six with two 4-2s in the space of three races. In between those, Bjerre was comfortably leading a 5-1 before inexplicably falling on the final bends. But the dynamo Dane picked himself up and dusted himself down to end his night on a high while Shanes was forced to settle for third after a terrific battle with Andersen. Tigers made sure of the win though with two races to spare. Proctor was penalised with a 15 metre handicap for touching the tapes and Wright and Howarth took advantage with another maximum. And when Kurtz and Shanes combined for a 4-2 in the penultimate race, it meant the Tigers were assured of all four points available. REDCAR 39: Ty Proctor 11+1, Ben Barker 10, Jonas B Andersen 7, Nathan Greaves 6, Jordan Stewart 3+1, Mikkel B Andersen 1, Theo Pijper 1. SHEFFIELD 51: Charles Wright 15, Todd Kurtz 12, James Shanes 10+2, Kyle Howarth 7+2, Lasse Bjerre 7+1, Jack Smith 0, Josh Bates R/R.